South Korean models Kang So Young (강소영), Lee Hye Jung (이혜정) as well as Lee Hyun Yi (이현이) were featured in an editorial from Vogue Korea February 2011, photographed by Ogh Sang Sun. The models were dressed in garments from Aigner, Bottega Veneta, Burberry Prorsum, Céline, Chanel, Dior, Fendi, Gucci, Hermès, Jamie & Bell, Jil Sander, Louis Vuitton, Nina Ricci, Prada, Salvatore Ferragamo and more with flower wreaths. I personally think the editorial will work better with a dull background instead of the pastel-colored background. My favorite shot was definitely the one with Kang So Young (강소영) and Lee Hye Jung (이혜정) lying on each other, dressed in Marc Jacobs. 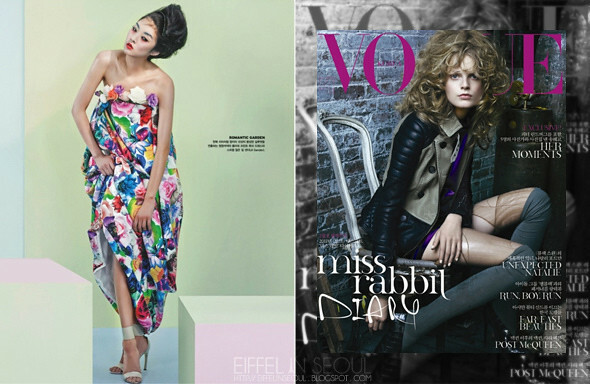 It's nice to see Kang back with Vogue Korea.